September is shaping up to be a busy month for me; revisions on books two and three are picking up again, I’ve agreed to put together a large-scale, gallery exhibition for next summer, and I’m in the process of completing two separate illustration commissions. I’m also gathering material and images for the first issue of my quarterly newsletter/zine. All of this abundance, and I have the privilege of participating in a month long promotion with fourteen fantastic indie authors. Back in June, a petition requesting that Amazon reconsider its heavy-handed method of removing reviews was circulated. I signed it then, but I thought it would be a good time to bring it back into the light in case some of you missed it. There are only a couple of hundred signatures needed to send it off. I review the books I’ve enjoyed and ‘following’ the Authors on social media is the best way to stay current with the material they produce – especially when they are Indie Authors. If reviews are going to be taken down because of this, it not only wastes the reviewers time and energy but demonstrates that you are guilty of pushing a bias/agenda of your own – one that favors the large publishing houses over the self-published. Is it only about the money? You are a company, you’re there to make money, and ‘The Big 5’ have large advertising budgets. What about providing service? Indie Authors require the reviews to become visible on Amazon. By following my favorites, the only prejudice I’m showing is my preference in reading material and style. This strong-arm method you’ve deployed not only prevents the new author from finding a place in the market via your algorithms, but it also keeps them from improving through constructive critique. I’m sure there are reviews out there that are done by well-meaning family members or purchased via book sites, but I dare say it’s not the norm. Credit us, the purchasers, with some intelligence; most of us are smart enough to recognize a proud grandma or a bot. We’re certainly capable of spotting trolls. Amazon, leave the reviews alone. Would you like to subscribe? If so click on the image and sign up. FEATURES – I’ll reiterate for those of you who can’t read the micro-print on the cover. A short story set four years before the beginning of The Korpes File. A base-camp goes silent, deep inside the boundaries of the fetid jungle known as ‘The Seep’. Colonel Kael Sunder and his crew are deployed to find out what happened, and, if necessary terminate all survivors. 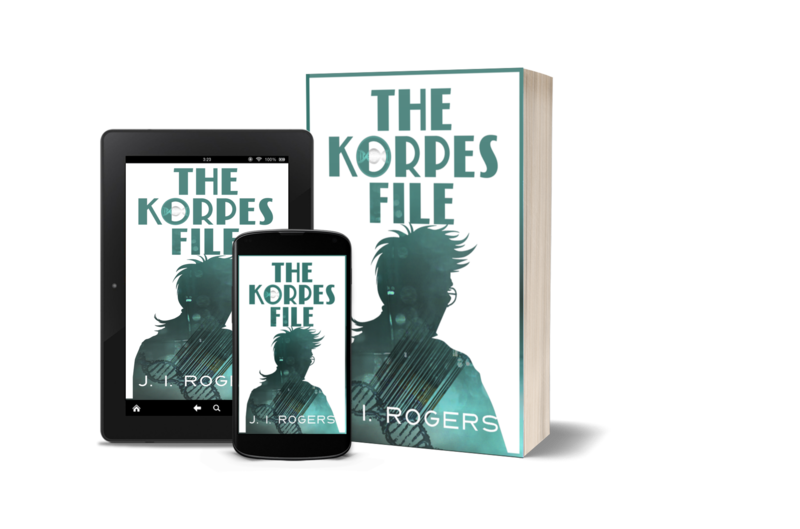 A Chief Inspector with Korlune Internal Security, gifted with unusual intuitive abilities, ‘interviews’ other characters from the series. This issue’s subject is Ashley Harlo, primary med-tech assigned to the Armatus Project and heiress to the Harlo fortune. Royce Malvyne, retired KMR&D comptroller, shares some of his caricatures of his fellow characters. Home to links, polls, and other interactive material. Feedback is welcome. Thank you, everyone, who voted (especially those of you who tried to do it twice). When it comes to understanding and learning to use social media to promote your books/art, there is a lot of information to wade through. Everyone and their sacred goat seems to have books, blogs, videos offering up their hard-earned wisdom. Sadly, there isn’t enough time in the day to go through it all, so I’ve picked two of the best I’ve found in the last few weeks. 10 Essential Tips to Avoid Being Blocked by Facebook and being sent to “Facebook Jail”… and don’t fall asleep reading the fine print rules. Thanks, S. A. Gibson, for sending this to me while you were experiencing the blue-thumb ban. Click on the image to open the article. Twitter appears to be something you either love or hate. This article provides a solid concept on how to tackle the 140 character barriers and connect with your followers. I noted there were other topics of interest on this site, but I haven’t had a chance to check them out, yet. Click on the image to open the article.